We Have one Upstairs Apartment, Two Private Rooms in the Main Lodge plus other unique spaces available. Click“book now on Airbnb.com” beneath each description below. To see all the listings once you are on Airbnb site, click on my bio picture to view all units and to make reservations OR copy and paste in your browser the listings below. ALL ROOM PRICES INCLUDE TAX and a continental breakfast provided in your room. A two bedroom apartment with a sleeping loft, includes one full bath and access to another full bath in the Main Lodge and a small kitchenette. Sleeps up to six people (see listing for details on pricing). Includes a stunning view of the Coconino National Forest and the awesome Night Sky from it's very own private outdoor deck. Click "BOOK NOW" below to see this listing on Airbnb for current seasonal rates, more pictures and all the details. OR email us via the bottom of this page--click "Contact". "The Roost" Entryway up the stairs. "The Eagle's Nest" Sleeping Loft and kitchenette. 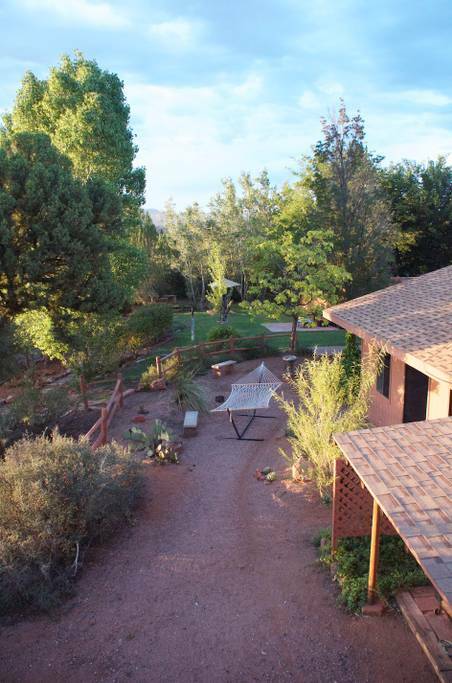 Private Bedroom with 1 Queen bed and 1 Twin bed, 1 Full bath and it's own patio facing the Coconino National Forest. 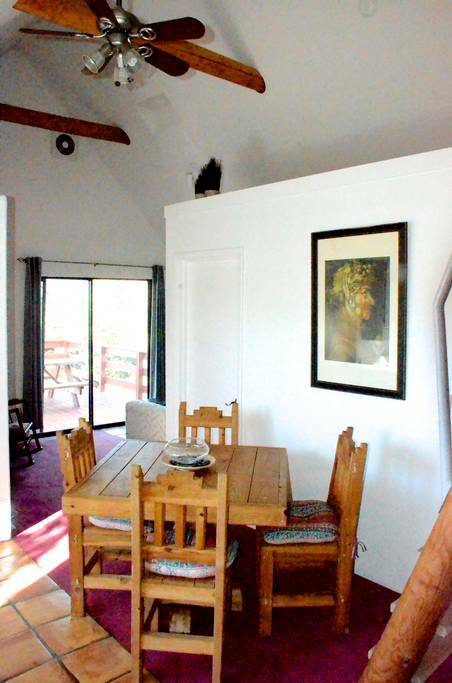 The Deer Suite is in the Main Lodge and sleeps up to 3 people. Click "BOOK NOW" below to see this listing on Airbnb for current seasonal rates, more pictures and all the details. OR email me via the bottom of the page--click on "Contact". Queen bed, twin bed, private bathroom, mini-fridge, toaster oven, tea kettle, coffee maker and continental breakfast for 3. 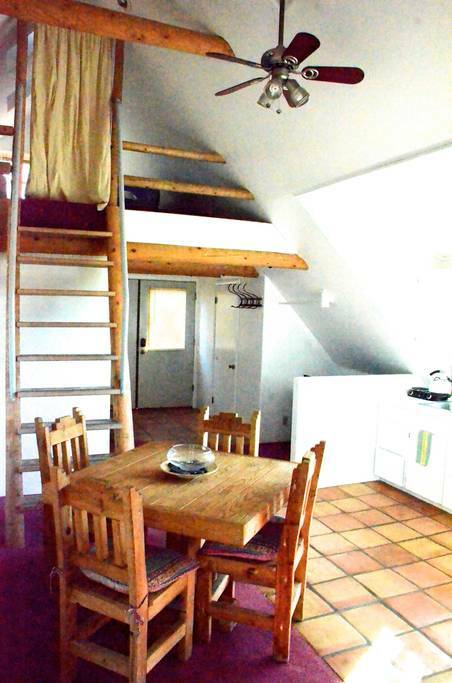 Private Bedroom with Full Bath, One King Bed, One Twin Bed, Sleeps up to 3 people. King bed, twin bed, private bathroom, mini-fridge, toaster oven, tea kettle, coffee maker and continental breakfast for 3. Contact Meaghan for more information about renting the facility for groups/retreats for up to 13. Thank you so very much for providing such a beautiful sanctuary. Much appreciated and with all my love. Thank you for sharing your gifts, your community and your space with me. This was a huge life changing experience, and I know that I was meant to cross paths with you here. I wish you and your amazing staff/community a great Holiday season! Meaghan, Thank you for being one of those special people. And thank you so much for openly sharing your healing medicine with me this week. I could not have asked for a better experience. Your insight and encouragement have inspired me to find my own path and a real expression of myself ....with intention! Dear everyone at Sedona Sacred Rocks, One hundred million thank yous for allowing us to rest here in this beautiful place. Thank you from the bottom of our hearts for helping us make this trip so special. I could not have pulled off such a magical moment without your help. Everything turned out amazing. It was like the ending of a cheesy, romantic movie and we LOVED it! This is such a beautiful and sacred place. We will never forget the love and positive energy that we experienced here. Thank you for making that possible! Our stay was above and beyond. Sedona Sacred Rocks has our hearts and we cannot wait to return! Your humble abode is so peaceful and nurturing. I will recommend your place to everyone I know! Thank you again for letting us stay. All we can say is wow! We are leaving here feeling relaxed, energized, and inspired. Thank you for all the great memories and for making this milestone birthday celebration absolutely perfect! Sedona Sacred Rocks will forever hold a special place in our hearts. Special thanks Magi, Kosmo, and the rest of the horses and their healing energies. And to Meli, Francis, and Yin, for being the perfect little hosts! We had an AMAZING experience! So many wonderful people, and the space was just impeccable. Very private room and a great healing center where you can do as much or as little as you like! Meaghan was outstanding!!!! Thank you, Antonio and Veronica....I am blessed to know you...see you in December :)...big hugs! Stephen welcomed my mother and me, and he guided a small group through an intimate, liberating candle ceremony. He is a warm, generous soul and was very open to sharing his spiritual experience, local insight, and on a more spontaneous note, his tweezers with us. We met Meaghan, who is just about one of the most ingenuous huggers in Arizona, on one of our last days. Unfortunately, we had to cut our visit a day short due to logistics, yet Meaghan was wholly understanding and accommodating! The center is an ideal retreat for those seeking to lose themselves in nature and positive wavelengths. We will definitely stay here again to purge ourselves from the city's hustle! Thank you so much, Rob for your kind words! I really enjoyed meeting you and your Mom and am so glad you had a nice time....Rob, you are THE best hugger I have ever experienced....the world needs this so much and I honor your beautiful Heart and way about you....one of the kindest persons I've ever met .....hugs to you and your Mother and I look so forward to your return!